2Take a morning dip in the ocean right off the sundeck of your Maldives Jacuzzi Water Villa or end the day on a romantic note with a luxurious whirlpool indulgence for two under the stars. All 54 of our sought-after overwater villas feature a private open-air Jacuzzi. Tariffs quoted in US$, per Room per Night, includes Full Board Buffet Meals: Breakfast, Lunch and Dinner. Tariffs Includes 12% GST and Green Tax of US$6.00 per Person per Night and are subject to change. Suspended over the water, in the gorgeous Veligandu lagoon, the Sunset Jacuzzi Water Villas are the best address for an island getaway. Enjoy an oceanfront beach location and private Jacuzzi with our Jacuzzi Beach Villas. 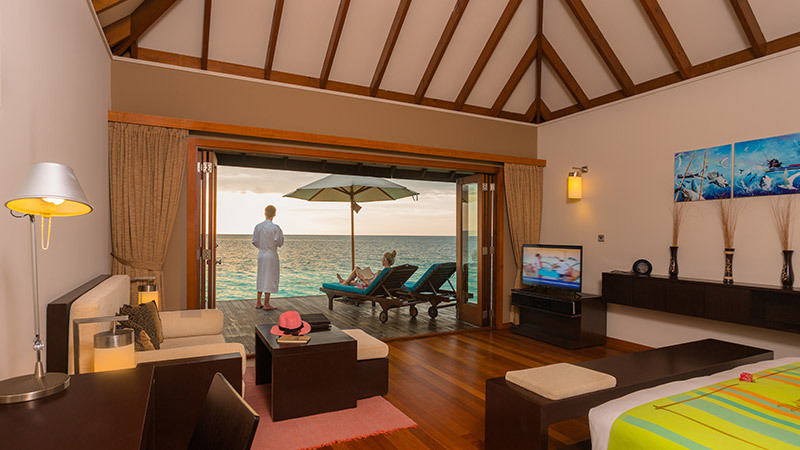 Experience direct access to the ocean via the private staircase of our Water Villas. Soak up scenic ocean views from your Beach Villa, just a few steps from the beach.